With the playoffs just over a month away, the surging New York Rangers know they can't overlook any opponent, especially a Boston Bruins team that shares sixth place in the Eastern Conference with them. The Rangers hope to pull ahead of the Bruins when the teams meet Sunday at Madison Square Garden to conclude their 2007-08 regular-season series. New York (35-24-9) has won five of its last six games, and improved to 8-0-3 since Feb. 9 with a 4-1 road victory over the New York Islanders on Thursday. Sean Avery scored twice and Henrik Lundqvist turned aside 26 shots to help the Rangers bounce back from Tuesday's shootout loss to the Islanders, which ended their four-game winning streak. "I felt good the whole game and I felt like the guys were on their toes," said Lundqvist, who is 6-0-2 with a shutout and a 2.24 goals-against average in his last nine games. "Every time there was a scramble in front, they cleared their guys and got the pucks." That scrappy play is exactly what the Rangers will need to make their third straight trip to the postseason. New York trails Atlantic Division-leading New Jersey by seven points with 14 games remaining, and is still clearly in the mix for its first division crown since 1993-94, when it last won the Stanley Cup. "We talked about it before the game," Lundqvist told the Rangers' official Web site. "We've focused so much on earning a playoff spot, but now we have to look above and try to reach the first spot." First, though, the Rangers must defeat Boston (36-25-7), which has won all three meetings this season, two by shootout. 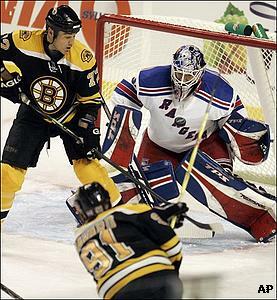 New York had taken eight straight from the Bruins from Nov. 20, 2005-March 24, 2007 prior to this skid. Despite New York's struggles, Lundqvist has been exceptional against Boston, posting a 1.90 GAA and a shutout this season. He is 7-1-2 with a 1.45 GAA and two shutouts in 10 career games versus the Bruins, who last swept the regular-season series in 2003-04. The Rangers have won four of their last five overall at home, but Boston came away with a 3-1 victory at MSG on Jan. 20 in the most recent matchup. The Bruins haven't won back-to-back contests there since March 13-Dec. 8, 2002. Boston avoided its fourth straight defeat with a 2-1 home victory over Washington on Saturday. Zdeno Chara and Marco Sturm scored power-play goals late in the third period to avenge a lopsided 10-2 defeat to the Capitals on Monday. Alex Auld made 23 saves, but hasn't faced New York yet this season. Tim Thomas has started the last two, stopping 54 of 59 shots in winning those games. Thomas, who is 2-4-2 with a 3.27 GAA in eight all-time contests against New York, is 3-2-0 with a 3.55 GAA in his last five overall starts. Auld, meanwhile, is 3-1-1 with a 2.81 GAA in his last seven appearances. It is unknown who will start for Boston, but the one thing the team is certain of is its goal to reach the postseason for the first time since 2003-04. "It's not going to be an easy uphill climb, but we've got to start somewhere, and we've just got to find ways to win hockey games and get our game back on track," coach Claude Julien told the Bruins' official Web site.